Due to the low price of wheat and heavy late season rains in several world production areas, notably France and other parts of Europe; the U.S. Department of Agriculture (USDA) increased world feeding of wheat during the 2016/2017 crop year by nearly 300 million bushels in the July 2016 World Agricultural Supply and Demand Estimates (WASDE). Feed and residual use in the U.S. was increased by 100 million bushels to 300 million bushels. Even at this early stage of the 2016/2017 crop year, the amount of wheat fed to livestock will be a key pricing factor in the U.S. and international grains market. This article therefore updates a farmdoc daily article from October 25, 2012 that examined the historic role of wheat feeding in the U.S. and the factors associated with it. Data on the feeding of wheat were collected beginning with the 1974/75 crop year from the WASDE reports. The specific use category is “feed and residual.” Thus, the category is best thought of as “use mostly for livestock feed” (see data note 1). USDA currently projects that feed and residual use will account for 13.3% of total use of U.S. wheat during the 2016/17 wheat crop year (see Figure 1 and data note 2). The average share since 1974/75 is 9.1%, with a range from 16 million bushels or a 0.7% share in 2007/08 to 484 million bushels or a 19.9% share in 1990/91. 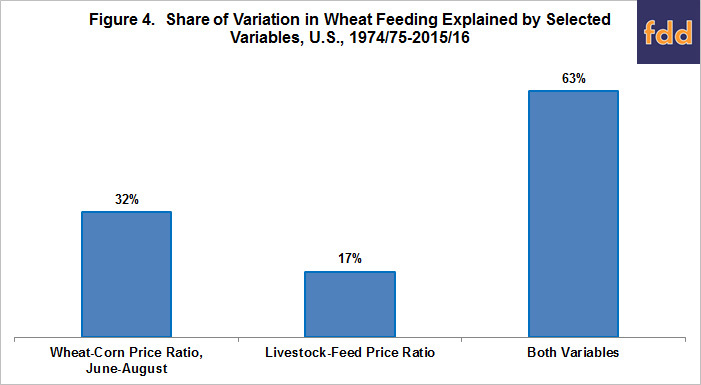 As Figure 1 illustrates, no trend over time is evident in the share of U.S. wheat fed to livestock. Economics suggests that, everything else the same, the lower the ratio of wheat price to corn price; the less expensive wheat is as a feed ingredient relative to corn. Thus, more wheat should be fed. Moreover, wheat feeding is concentrated in June through August, the first quarter of the wheat crop year. The latter implies the relevant wheat-corn price ratio is for the months of June through August. The average wheat-corn price ratio for these 3 months is 1.33, with a range from 1.04 in 1984 to 1.85 in 2006. The expected negative relationship between share of wheat fed to livestock and the June-August wheat-corn price ratio is reflected in the downward sloping line in Figure 2 (see data note 3). The latest month for which USDA, National Agricultural Statistics Service (NASS) has reported prices is June 2016. 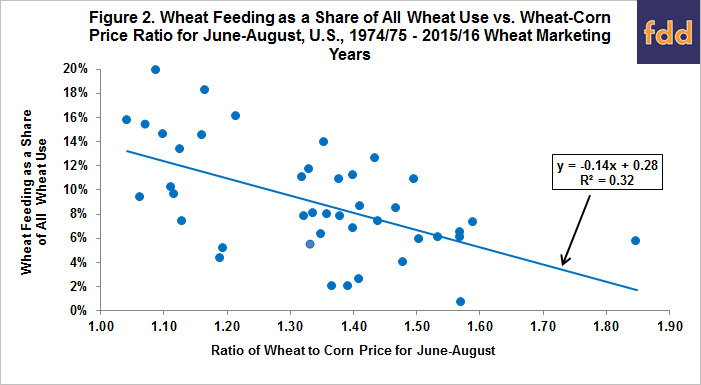 The wheat-corn price ratio is 1.10, the 7th lowest for June since 1974. Economics also suggests that, everything else the same, the higher is the ratio of livestock and livestock product prices to livestock feed prices, the greater is the share of wheat that should be fed. The decision to use any ingredient, including wheat, in a livestock feed ration is a complex management decision. Energy and nutritional needs in a balanced ration are specific to both animal species and type of animal within a species. Moreover, changing the role of wheat in a ration during a feeding cycle can materially reduce feed efficiency. Hence, livestock feeders want to be relatively certain that wheat will remain a cheaper source of feed throughout the feeding cycle. 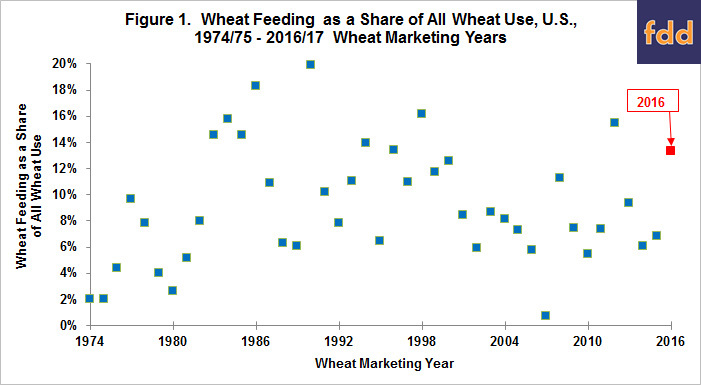 This consideration may partially explain why the share of wheat that is fed is positively and statistically significantly correlated in adjoining years, +0.40. The preceding discussion also argues for a longer term measure of the livestock-feed price ratio. Because the data on wheat feeding is by wheat crop year, this ratio is calculated for the wheat year. Specifically, it is based on an average of the 6 livestock feed-price ratios reported by USDA, NASS (see data note 4 for specifics on how the ratio is calculated). The average livestock-feed price ratio for the wheat crop years beginning with 1974/75 is 1.01, with a range of 0.59 for 1974/75 to 1.56 for 1986/87. The livestock-feed ratio for June 2016 is 0.97, or slightly below average. 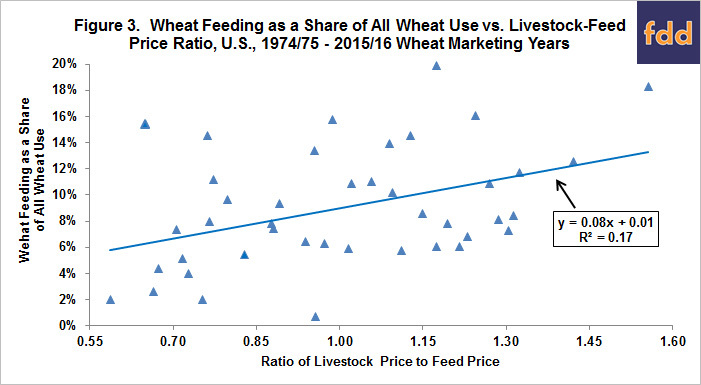 The expected positive relationship between the share of wheat fed to livestock and the livestock-feed price ratio is reflected in the upward sloping line in Figure 3. Explanatory power of the livestock-feed price ratio is roughly half the explanatory power of the wheat-corn price ratio when both are evaluated as a single explanatory variable. Explanatory power of the variation across wheat crop years in the share of wheat fed jumps to 63% when both variables are evaluated together (see Figure 4). The estimated 2-variable equation is reported in data note 5. This analysis illustrates the potential importance of multiple variable regression when evaluating economic relationships. If we assume that the wheat-corn price ratio and livestock-feed price ratio for June 2016 are the values for the 2016/17 wheat crop year and use the equation reported in data note 5, the amount of feed and residual use of wheat during 2016/17 is estimated to be 289 million bushels. This estimate is quite close to the current USDA estimate of 300 million bushels. Feeding of wheat during the current 2016/17 wheat crop year is likely to be larger than normal. Primary reason is a ratio of the price of wheat to corn that is toward the lower end of its distribution since 1974. Projection is notoriously difficult, especially this early in the 2016/17 crop year; but, there is no reason to believe that USDA’s projected feeding of wheat in the U.S. cannot be attained. In short, for the 2016/17 crop year, wheat is likely to be priced more for its lower marginal value in livestock feed rations than for its higher marginal value in breads and other products consumed directly by humans. U.S. Department of Agriculture (USDA), Economic Research Service (ERS). Wheat Outlook. http://www.ers.usda.gov/publications/whs-wheat-outlook.aspx and http://usda.mannlib.cornell.edu. USDA, Office of the Chief Economist. July 12, 2016. World Agricultural Supply and Demand Estimates. WASDE-555. http://www.usda.gov/oce/commodity/wasde/index.htm. USDA, National Agricultural Statistics Service (NASS). Quick Stats. https://www.nass.usda.gov/Quick_Stats/index.php. Zulauf, C. and N. Rettig. "Wheat Feeding." farmdoc daily (2):208, Department of Agricultural and Consumer Economics, University of Illinois at Urbana-Champaign, October 25, 2012. USDA reports that 23% more wheat was fed during the 1st quarter than during the entire year over the 1974/75 through 2015/16 crop years. Such a finding is not possible if the use category is only feed. This fact thus underscores the important role of residual use. The crop year for wheat is from June 1 to May 31. The explanatory power of 32% for the June-August wheat-corn price ratio substantially exceeds the explanatory power of 16% for the wheat-corn price ratio obtained by averaging the ratio for all months in the wheat crop year and the explanatory power of only 3% for the wheat-corn price ratio based on crop year average prices for wheat and corn. These comparative explanatory powers underscore the importance of the summer months to wheat feeding. The monthly ratio is expressed as a percent of the average of all monthly ratios since 1974. This variable is an indicator of the profitability of livestock production for the month relative to the average profitability indicator since 1974. The 6 relative monthly ratios are then averaged for the 12 month period of the wheat crop year. The higher is this ratio, the more profitable is feeding livestock. The estimated 2 variable equation is: wheat fed as a share of total wheat use in a wheat crop year = 0.22 - 0.18 (July-August wheat-corn price ratio) + 0.11(livestock-feed ratio for wheat crop year).